The LG AF300 AT&T Wireless Home Phone allows you to use AT&T’s cellular network for a traditional home telephone system as an alternative to a landline service. You can use your corded or cordless home phone without local service or pluging them into a wall jack. How Do I Boost the Cellular Signal To The LG AF300? If you live in an area where AT&T's cellular signal is weak, we can help. The best way to boost the cell signal to the LG AF300 Home Phone is using a powered cellular signal booster system. These systems are available for small areas or large areas. There are also portable options to move your signal booster system from place to place. They basically work by capturing a weak signal from your neatest AT&T cellular tower, amplifying the signal, then rebroadcasting the signal to your device, inside your building. 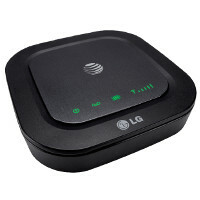 The LG AF300 uses AT&T frequencies GSM 850/1900MHz and UMTS 850/1900MHz. Any of the 3G boosters below will boost both frequencies.